Nora Alter’’’s research focuses on 20th-century film and theory, comparative literature (French, German and American) and visual and cultural studies. 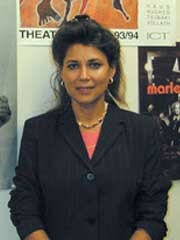 Alter teaches classes in film and media studies, critical theory and women’s studies. <BR> <BR> Alter has published two books, Vietnam Protest Theatre in 1996, and Projecting History: Nonfiction German Film 1967-2000, which was published in August. This latest work examines post-war German film production in the period leading up to reunification. Alter’s primary focus is on non-fiction films as they mediate politics and history. <BR> <BR> The book discusses the impact of political events-such as the Vietnam War, terrorism and reunification-on German and European filmmakers, and the implications of mass media spectacles for documentary filmmakers. Alter is also completing work on Sound Matters: Acoustics in German Culture, a collection of 15 original essays she co-edited that explore the many ways in which 19th- and 20th-century texts, artists and performers in music, theater, poetry and film have utilized sonic materials to enforce or complicate dominant notions of German cultural and national identity. <BR> <BR> Alter is currently working on a collaborative, book-length project with art historian Alexander Alberro on German art during the era of the Berlin Wall. Her interest in non-fiction cinema and her essays on art film and video have also led to another project titled The Cat Who Walks By Himself, a monograph on the French essay filmmaker Chris Marker. She has received research awards from the National Endowment for the Humanities and the Howard Foundation.